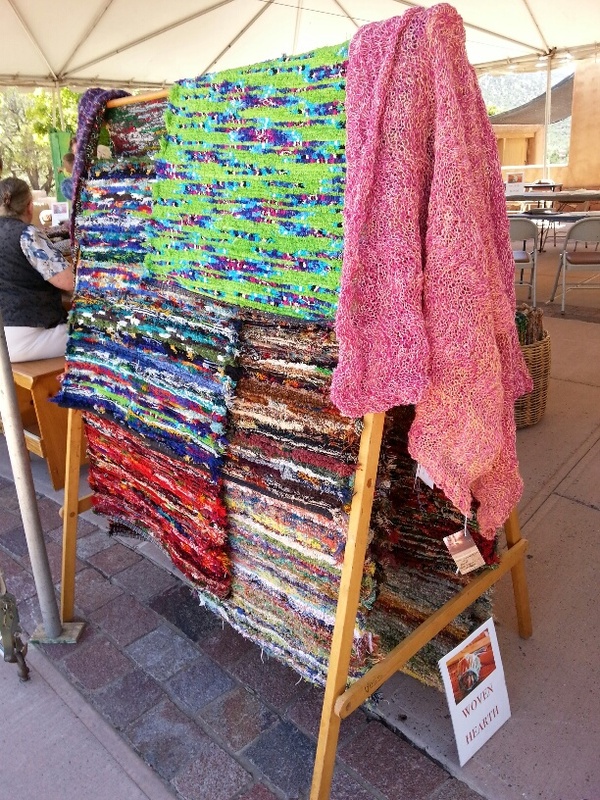 The New Mexico Women’s Foundation hosted the 2014 Santa Fe Rag Rug Art & Marketplace at Museum Hill on August 8-10. 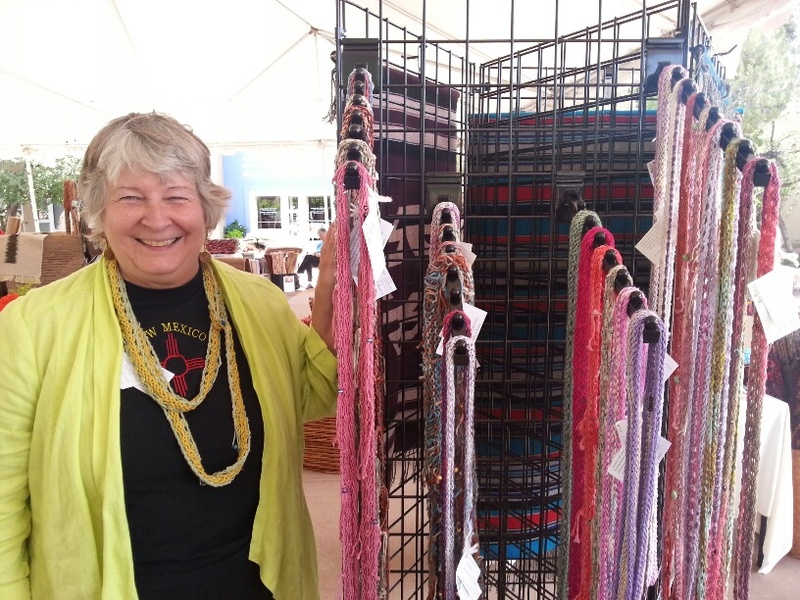 The amazing Gerry Cerf and her staff of volunteers put on this show. Many, many thanks to Gerry and all the folks from NMWF! 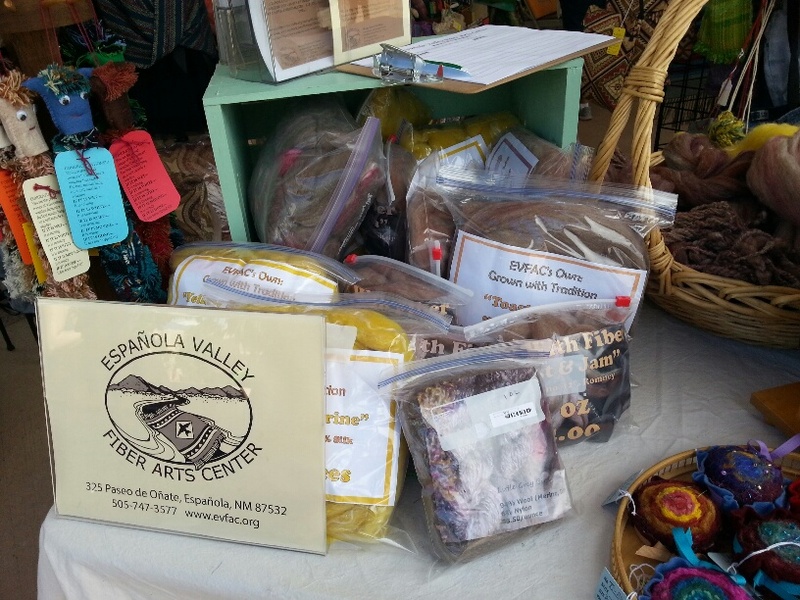 I assisted my mom (Sandy Voss of Cabin Textiles) last year with her booth, as I had just begun down the path of being a weaver full time. 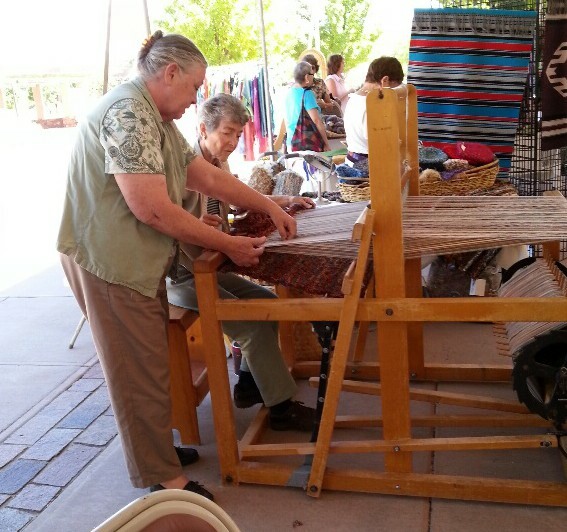 This year, we each got a booth and we were set up side by side, allowing us to share the loom that my mom brought. 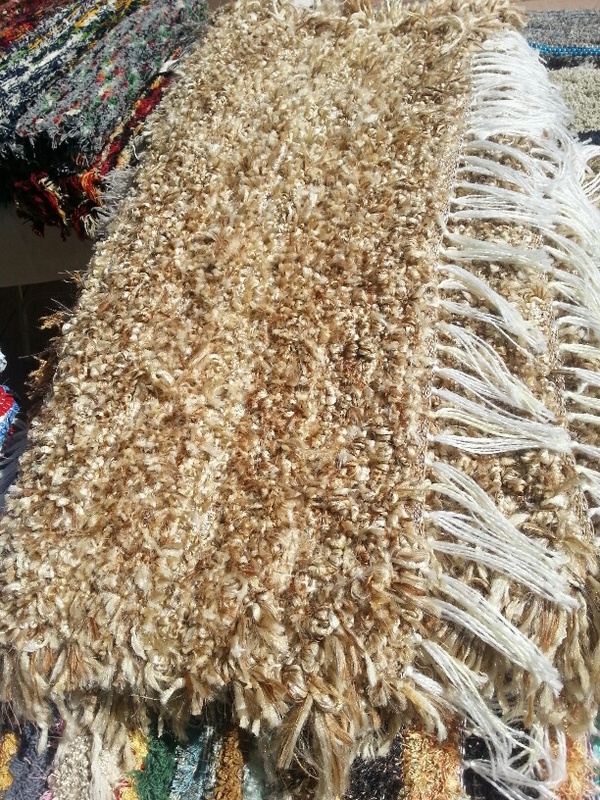 This year, certain animal products (such as leather, bone, wool, feathers, etc.) 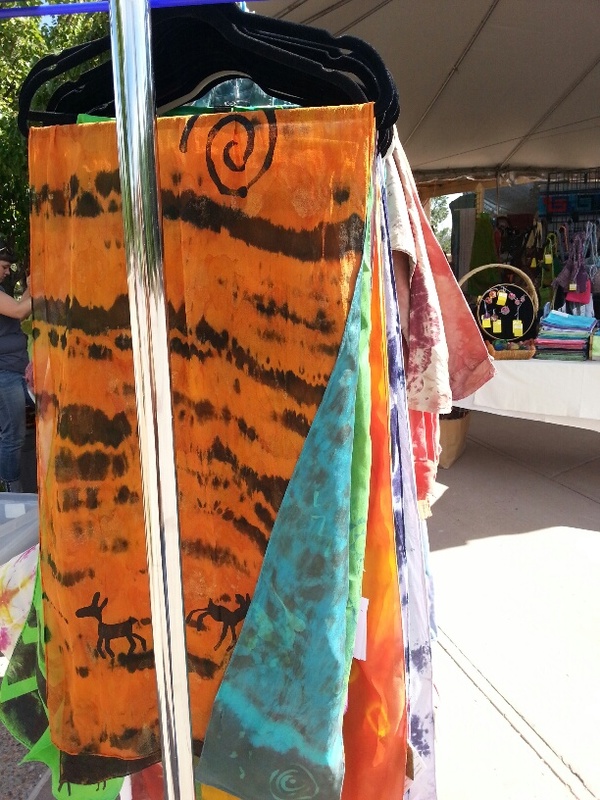 were encouraged to set up outside in the big tent. 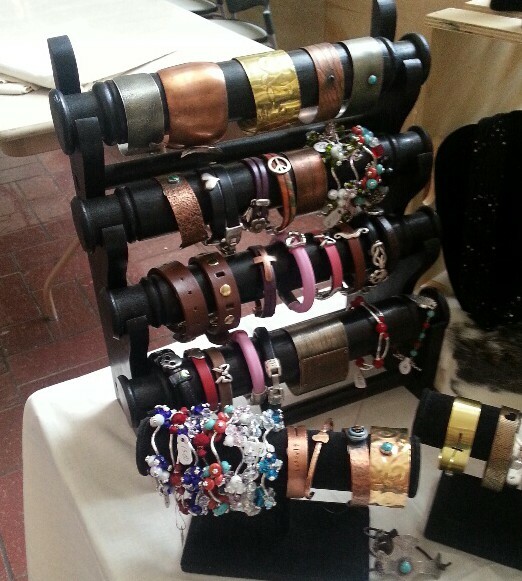 More artists (selling things like jewelry, wall art, clothing, etc.) were inside the atrium of the Museum of International Folk Art. This show exceeded all my expectations. My mom and I were busy the entire time, barely having time to snag a bite to eat (more like nibbling throughout the day). 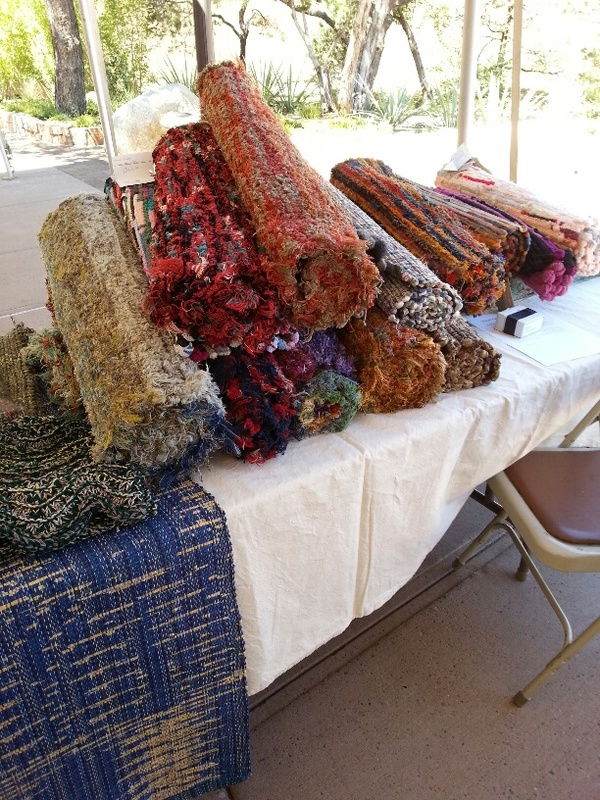 We quite enjoyed the crowd, talking about our rugs, the loom, my knitting, and my mom’s crocheted hats. Also, several friends stopped by to say hi. 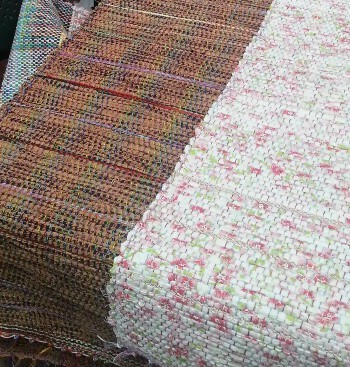 My feet were quite sore by the end of the Rag Rug Fest, but I was too pleased with the success of the show to fuss over them. What follows is a list of the artists I chatted with (and their contact info) and lots and lots of pictures. Enjoy! 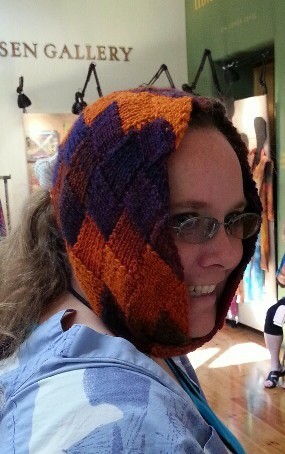 This is me trying out an Entrelac piece by Carol Eggers. 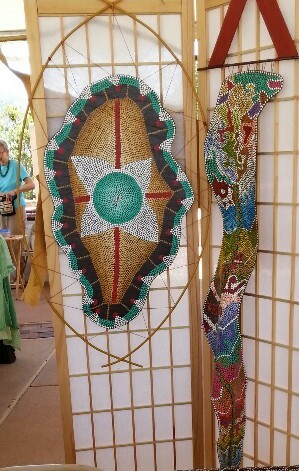 Bead work belts by Wendy Capek. 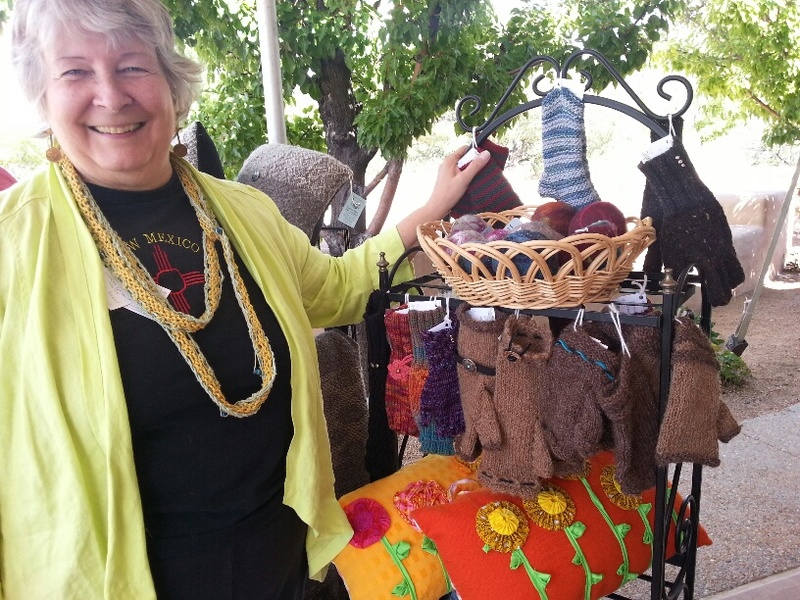 Knitted gloves by Kathy Konecki. 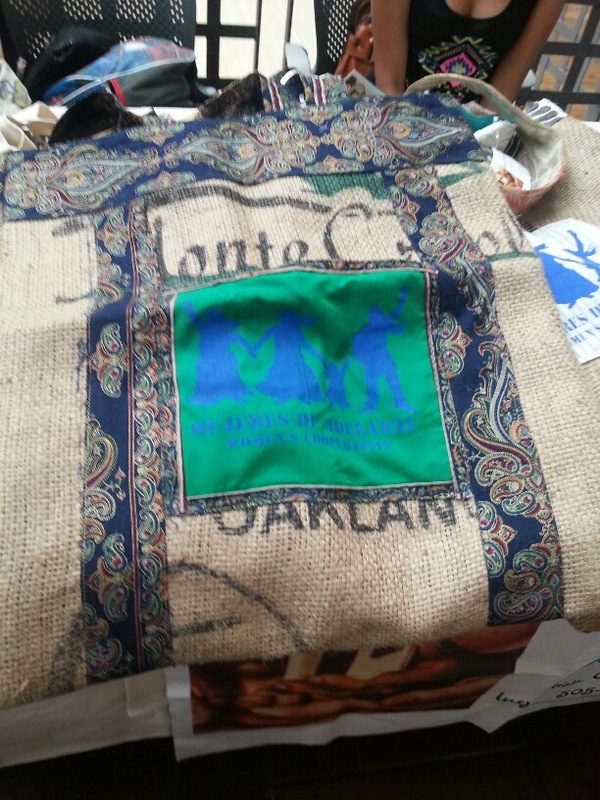 Decorated burlap bags by Mujeres de Adelante Cooperative. 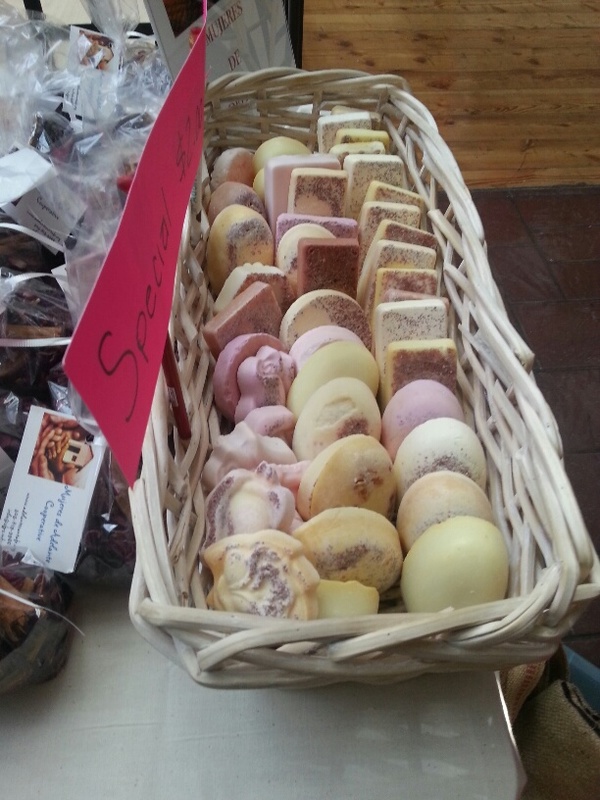 Hand-made soaps by Mujeres de Adelante Cooperative. 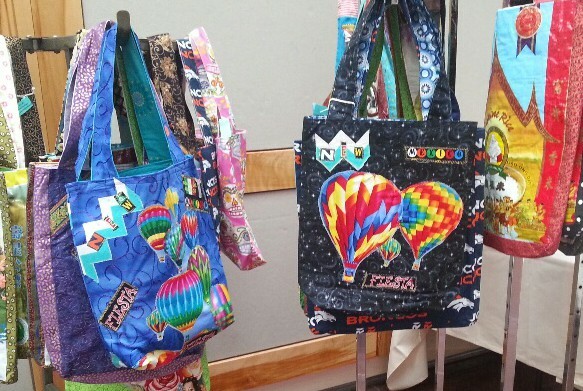 Tote bags by Duka Subedi. 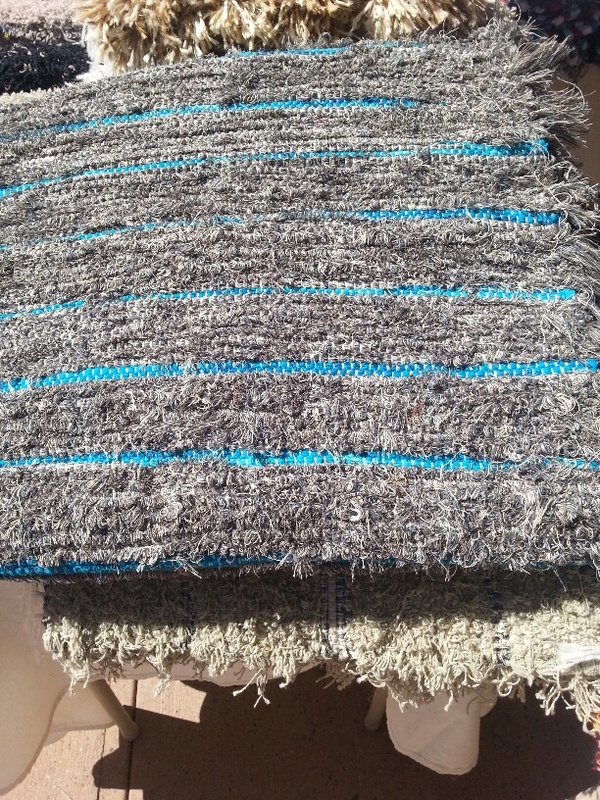 Blue jeans weavings by TDLT. 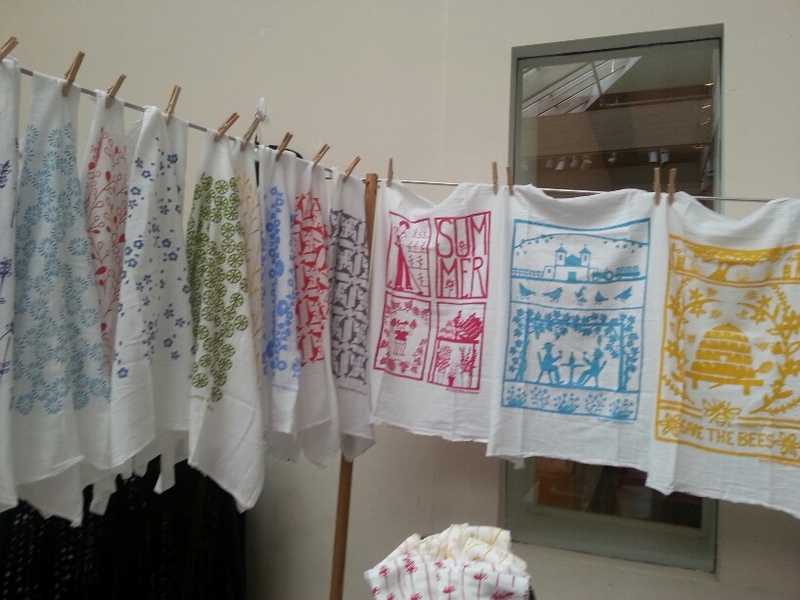 Hand towels by Kei & Molly Textiles. 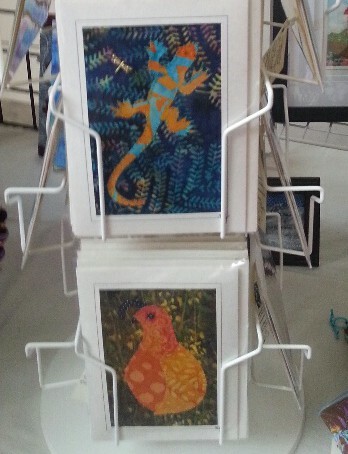 Greeting cards by SW Women’s Fiber Arts Collective. 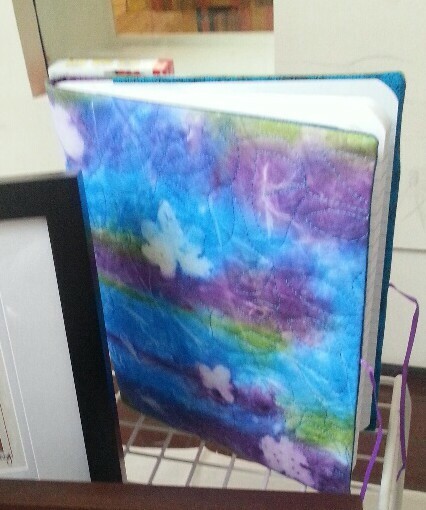 Quilted notebook cover by SW Women’s Fiber Arts Collective. 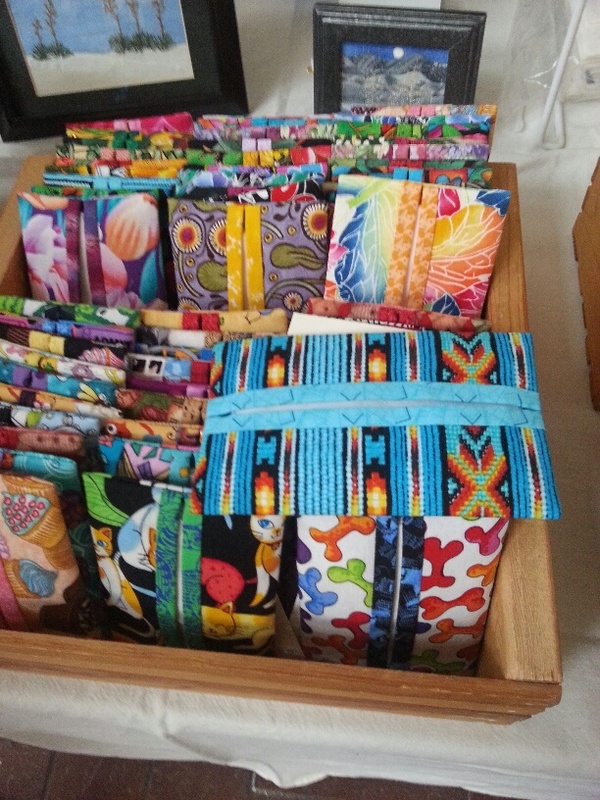 Little wallets by SW Women’s Fiber Arts Collective. 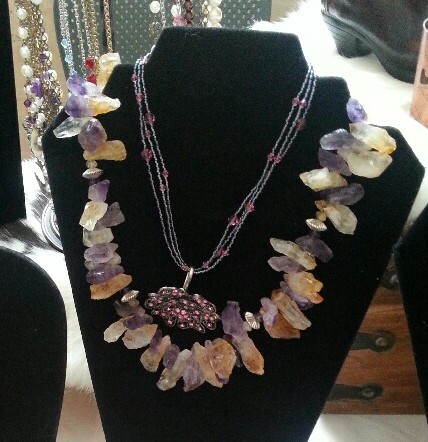 Amethyst necklace by Carmen Sena-Todd. 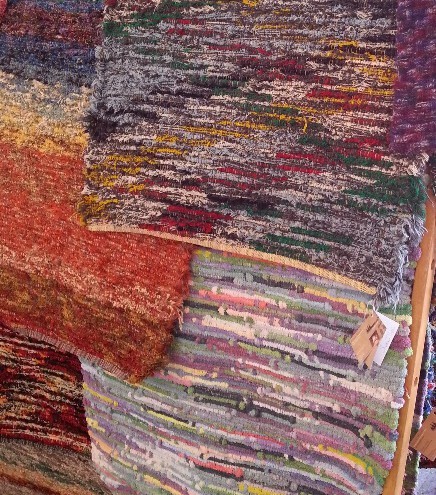 Fleece clothing by Susan Young-Tweet. 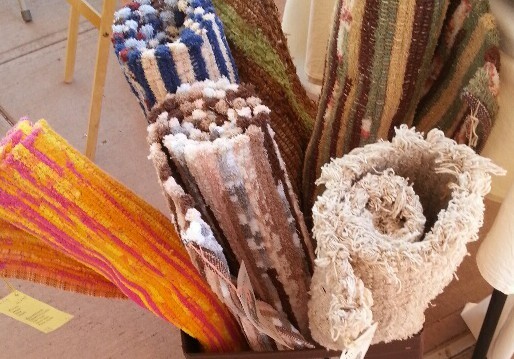 Towel rugs by Ann Lumaghi. 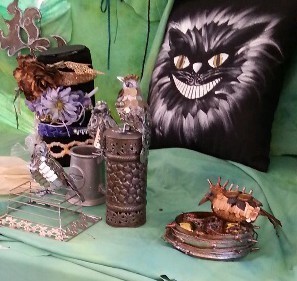 Birds, masks, cat pillow by Costume Salon. 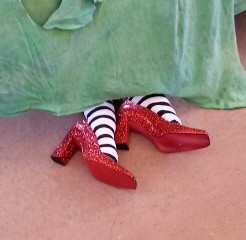 Wicked Witch feet by Costume Salon. 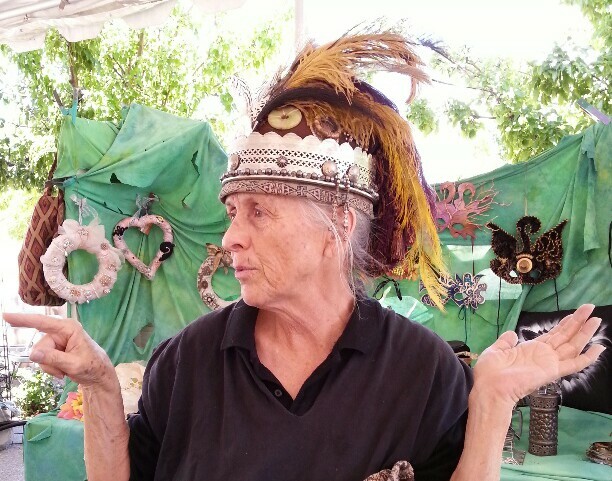 Julie of Costume Salon modeling her crazy cool hat. 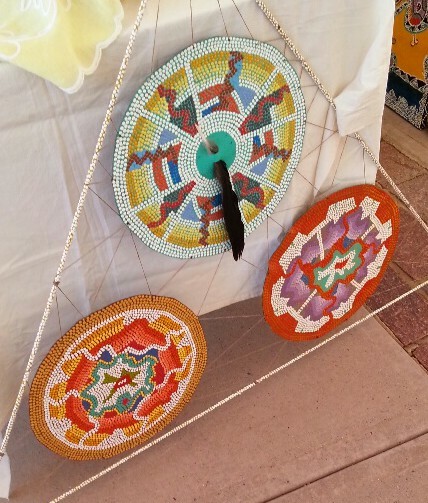 Decorative art by Lisanne Cole. 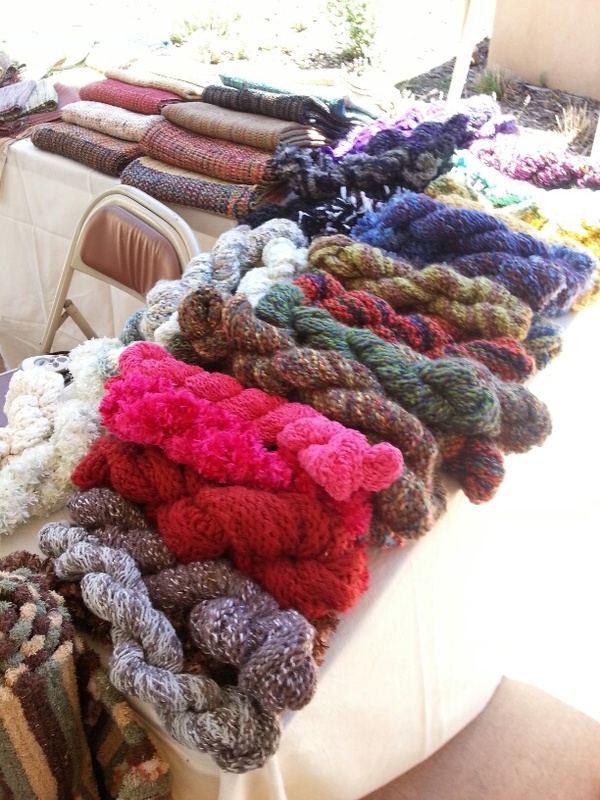 Hats crocheted from cotton selvedge, by Cabin Textiles. 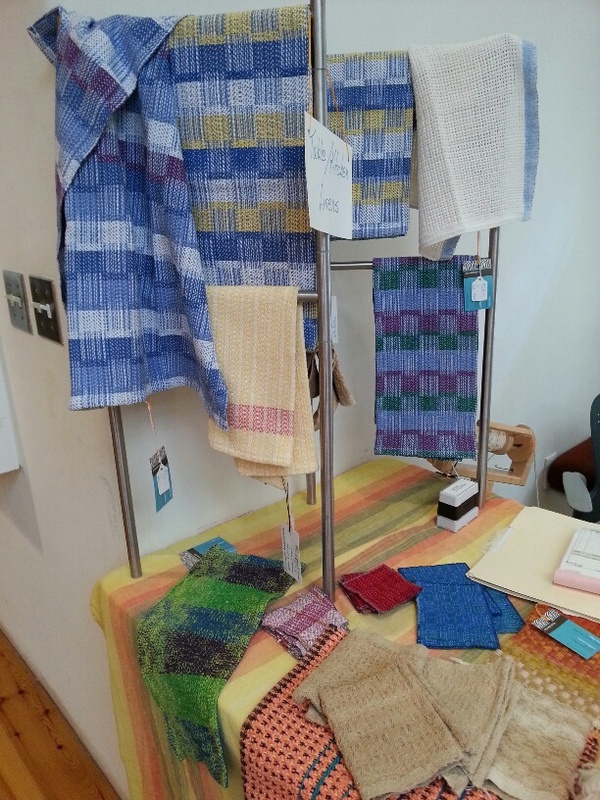 Weavings and knitted items by Cabin Textils & Woven Hearth. 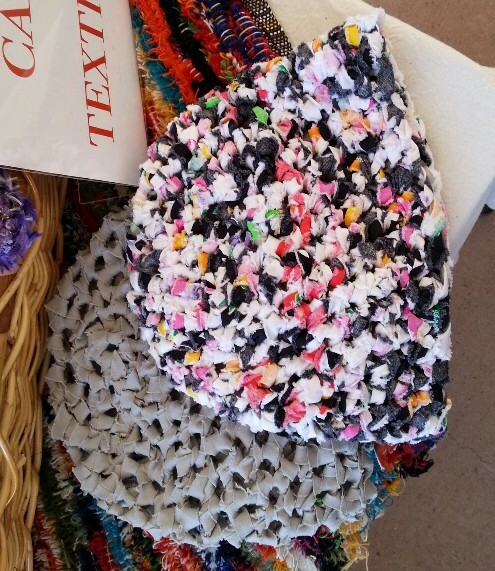 Rag Rugs by Cabin Textiles & Woven Hearth. 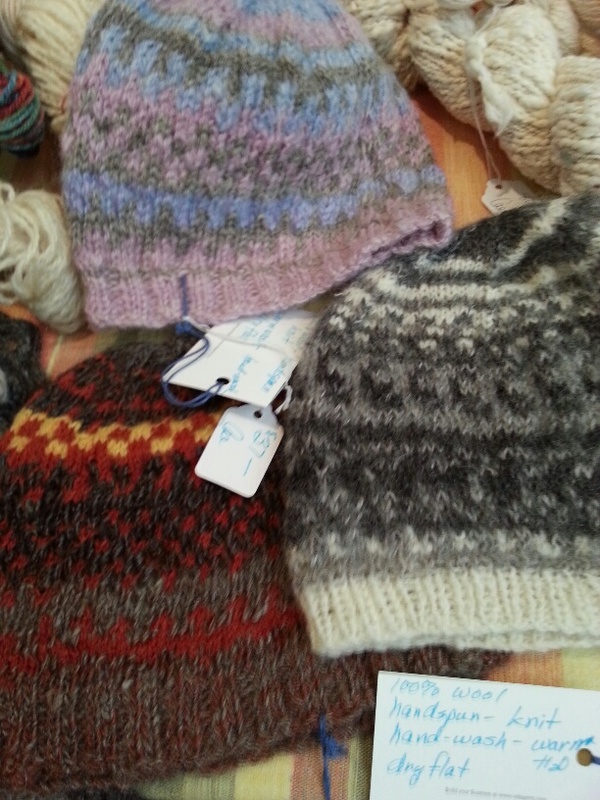 Knitted hats by Carol Eggers. 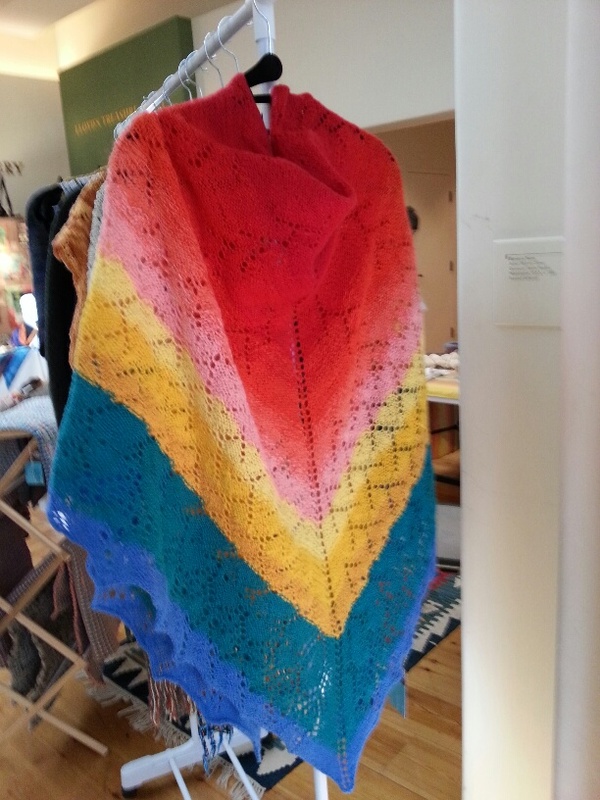 Rainbow shawl by Carol Eggers. 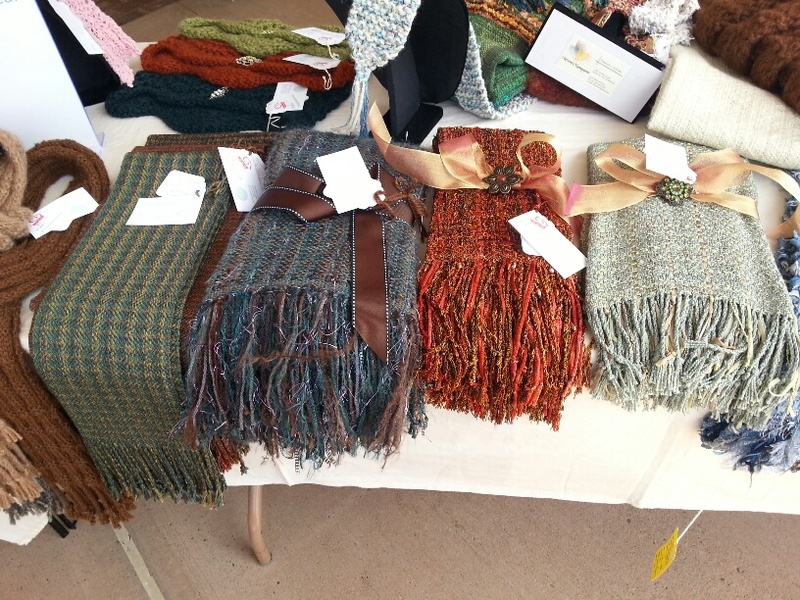 Woven items by Carol Eggers. 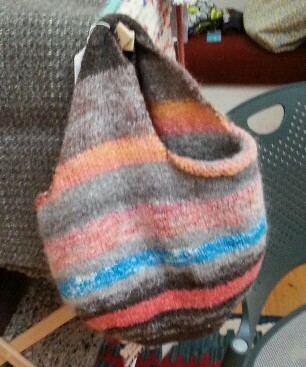 Knitted bag by Carol Eggers. 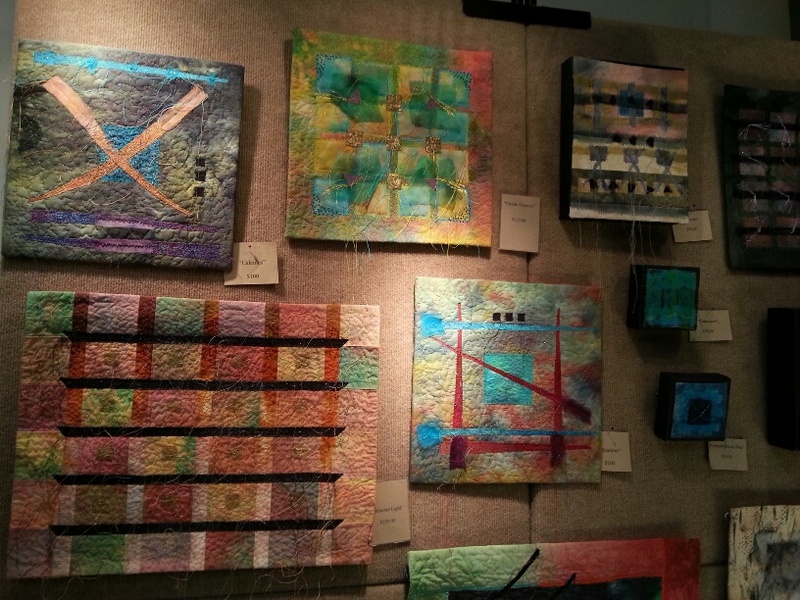 Quilted wall art by Renee Brainard Gentz. Santas by Renee Brainard Gentz. 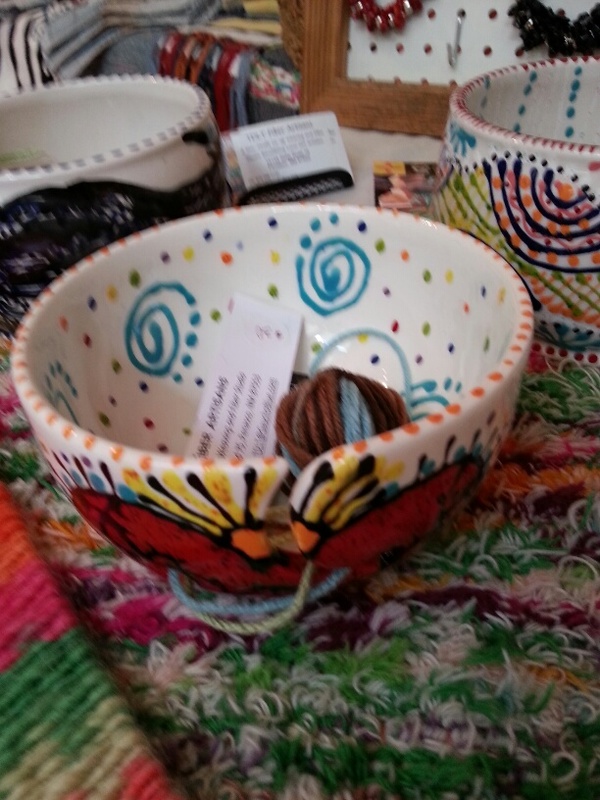 Keep your yarn balls in order with these bowls from TDLT. 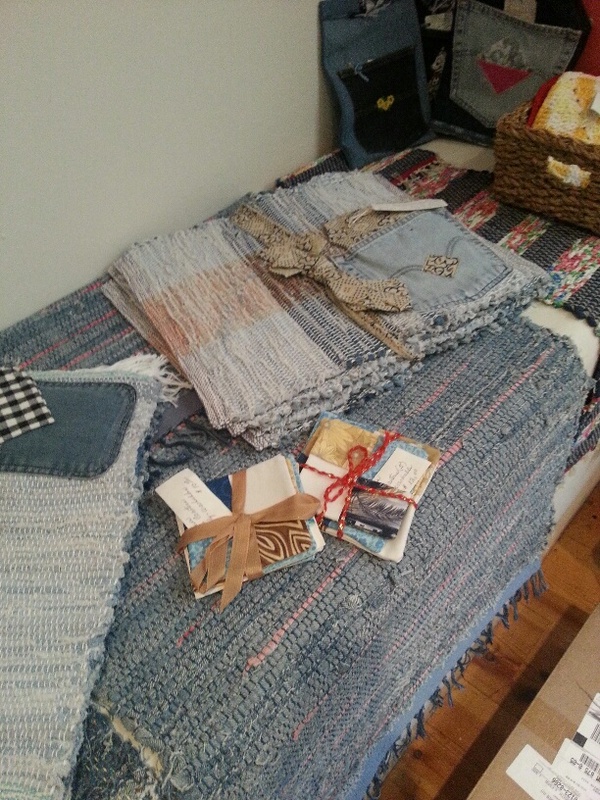 This is the personal artist book for Wendy Capek. 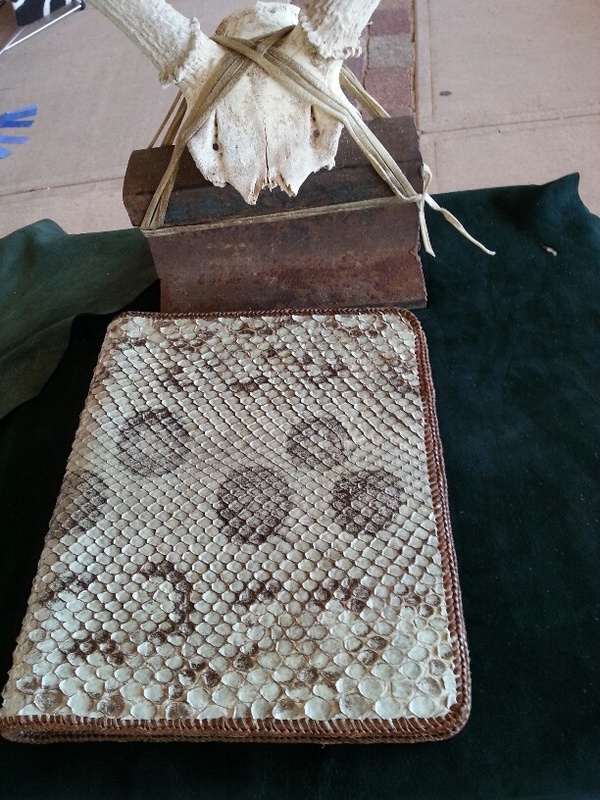 I really liked the snakeskin cover. 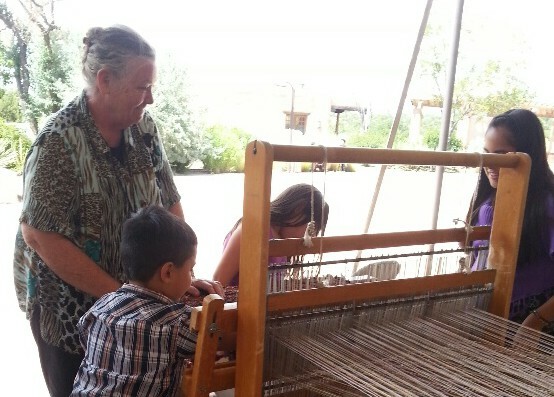 Sandy Voss teaching kids how to weave.